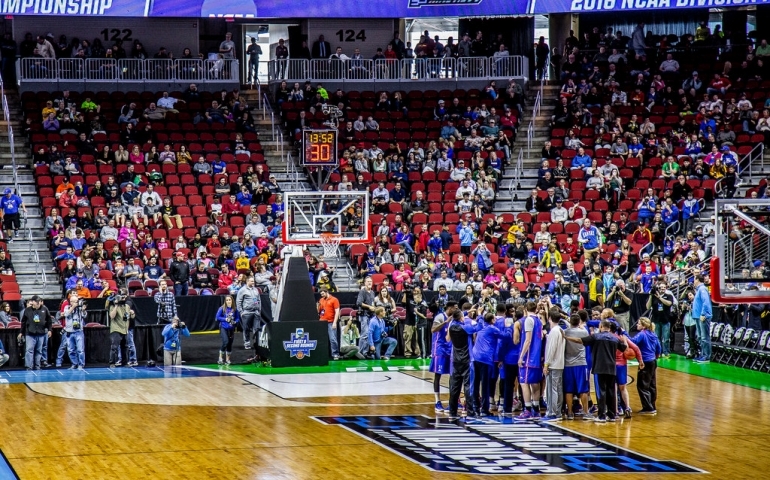 March Madness, which is the NCAA Division 1 Men’s basketball tournament, is arguably the biggest sporting event of the year, next to the Super Bowl. 64 teams make the tournament. There are 32 conferences, which means 32 teams get an automatic bid to the NCAA tournament by winning their conference tournament and the other teams make the tournament based on how good their record is, but it also depends on how tough the competition is. The powerhouse conferences such as the Big 12, Big 10, ACC, Pac 12, etc. get looked at the most because of how good those teams are. There are four regions and each region has 1-16 seeds, a #1 seed being the best, and a #16 seed being the worst. To reach the National Championship you have to win five games without losing in the tournament, and get a sixth win to claim the championship trophy. Another element to March Madness which seems to be happening more every year is upsets, which is when a low seed beats a high seed.For example, #2 seed Michigan State was a team who was predicted to win the whole thing, and they lost in the first round to #15 seed Middle Tennessee State. This was perhaps one of the top 3 upsets of all time, if not the biggest one. On the other side of the spectrum, many people did not predict Syracuse, a #10 seed, to go far in the tournament; they will be facing #1 seed North Carolina in the Final Four. The Final Four teams are: #2 seed Oklahoma, #2 seed Villanova, #1 seed North Carolina and #10 seed Syracuse. Oklahoma will play Villanova on Saturday April 2 at 5:09 p.m. central time in Houston, Texas, and North Carolina will play Syracuse at 7:49 p.m. central time in Houston as well.The winner of both of those games will play Monday night, April 4, in Houston at TBD for the National Championship. At this point, just like at any point in the tournament, it is do or die time. Being an Oklahoma fan, I would like to see Oklahoma make the championship and claim their first ever national basketball championship. It would be extremely special for the fans, the school, the players and coaching staff.Buddy Hield, a shooting guard for Oklahoma, who is arguably the best player right now in college basketball, being #2 in the nation in scoring, #1 in 3 point field goals made, #4 in 3 point percentage, Big 12 player of the year for the second season in a row and more than likely the player of the year, would have something to add on to all of those accomplishments. Be sure to watch the Final Four this weekend and see who will be advancing to the National Championship Game.